Welcome to the Big Fry blog. Big Fry Fish and Chips serve 450 customers in 3 hours! Last Saturday was Norway Day and to celebrate the occasion Big Fry Fish and Chips offered 99p fish and chips from 11:30-3pm. We served over 450 people with the 99p offer. The team at Big Fry would like to say Thank You to all the customers who went along and took part in the celebrations. The seminar was used to recognise all those Rushmoor’s food businesses who had received a 4 or 5 rating following food hygiene inspections by the council’s environmental health officers. The ratings range from 0 for food businesses that “require urgent improvement” to a 5 rating for “very good”. 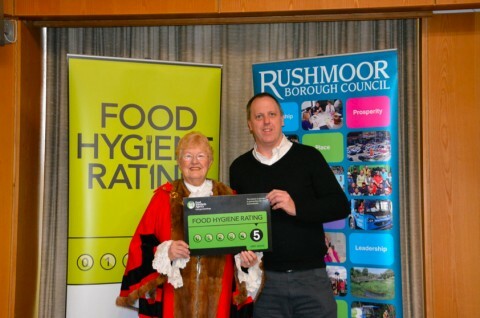 Those food businesses who scored highly were congratulated by the Mayor of Rushmoor, Councillor Diane Bedford, who said: “It is a real pleasure to be able to recognise the high standard of food safety in Rushmoor demonstrated by these local businesses. Our residents are increasingly taking the opportunity to find out how our local businesses look after the food we eat. Mark Sullivan, owner of Big Fry Fish and Chips in Lynchford Road, Farnborough was also at the seminar. He added: “A 5 food hygiene rating is the minimum requirement that my managers and staff expect. We have the systems in place to maintain that rating and we hope that this gives our customers the confidence that they are eating from a company that takes all aspects of running a food business seriously. “The rating can also be used as a good advertising tool and more importantly our customers can clearly see our rating on the front door as they walk in. As well as picking up their coveted rating window stickers, those at the seminar on Thursday 27 November also heard about new food safety law regarding the requirement for food businesses to inform customers about the allergens present in food. From 13 December, there will be new labelling requirements for businesses for allergens contained in pre-packaged food. Takeaways and restaurants will have to either provide allergen information up front, for example on menus, or signpost customers to where the information can be found. Sausage and Chips – Perfect Partnership! 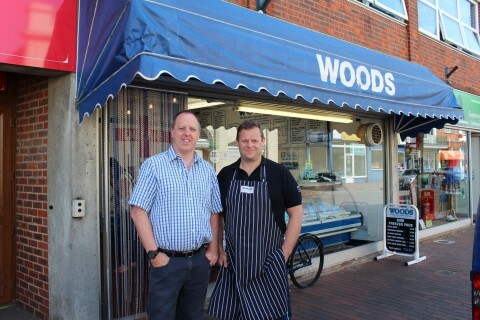 Mark Sullivan from Big Fry Fish and Chips has teamed up with Rob from Woods Butchers to provide the perfect sausage. Both local businesses in North Camp they decided to work together after meeting at a local networking event. Mark was looking for a supplier and decided to work with Rob who is just around the corner from the local fish and chip shop. Big Fry Fish and Chips have been fully wrapped! 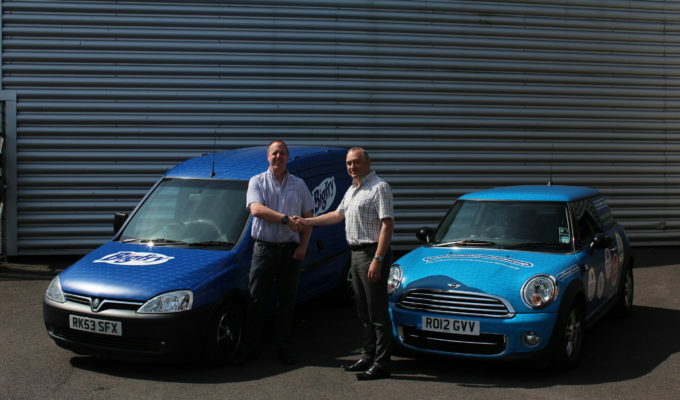 Mark Sullivan, owner of Big Fry Fish and Chips in North Camp wanted to spruce up his delivery van without it being to “in your face” whilst on his travels. After a chat with Andy from Reade Signs, Mark was really excited about the wrap and I think you’ll agree that Reade signs have done an amazing job. The wrap has the Big Fry logo subtly placed all over the van with big magnetic Big Fry logos on each side which can be removed. Big Fry Fish and Chips will be serving up 99p portions of delicious Norwegian cod and chips on Saturday 17th May to celebrate Norway Day in the UK (whilst stocks last). The Norwegian Seafood Council is working in partnership with 99 fryers across the UK to offer fish and chip fans the chance to hark back to the golden era of fish and chips and purchase a portion of their favourite takeaway for just 99p. A total of 16 tonnes of cod has been gifted to the 99 shops, including Big Fry Fish and Chips as part of the initiative, allowing nearly 40,000 people nationwide to join this celebration of our favourite dish of cod and chips. 99p fish and chips are being served by chippies in commemoration of the 200th Anniversary of the Norwegian constitution. Norwegian cod is a popular choice for British chippies due to its firm flesh and flaky texture, its light, delicate flavour, versatility and good quality. Fish and chip lovers can also enjoy this delicious fish supper with a clear conscious as the sustainability of Norwegian cod stocks are carefully managed in order to safe guard the fish for generations to come. This means that Norwegian cod is in plentiful supply, so much so that the vast majority of cod sold by fish and chip shops in the UK is caught in the icy, clear Arctic waters of the Barents Sea off the northern Norwegian coast. To see the day’s events unfold on twitter follow @norwayseafood search for #99pfishnchips. The Local & Loved Awards has seen the best businesses across the UK go head to head to earn the title of ‘The Most Loved Business in the UK’. For the 14 days leading up to Valentine’s Day consumers have had the chance to review and vote for their favourite local businesses. Consumers have now shown their love for great local businesses and tens of thousands of reviews added equating to one every 11 seconds as the contest gained momentum and the UK’s favourite business has finally been crowned. 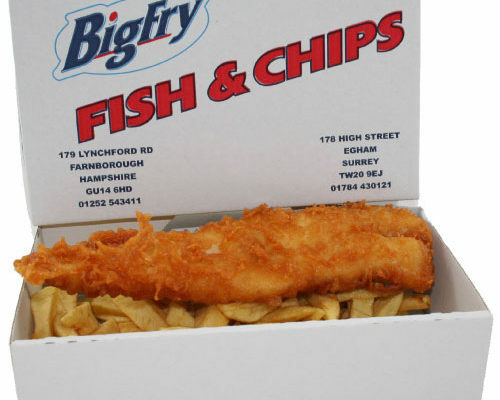 Big Fry Fish & Chips a local ‘chippy’ in Farnborough have claimed the title of the UK’s Most Loved Business in 2014. This accolade is so valuable and it’s not decided by ‘industry experts’, corporate sponsors or an ‘independent judging panel’, it has been awarded this title by the people that use this business regularly. 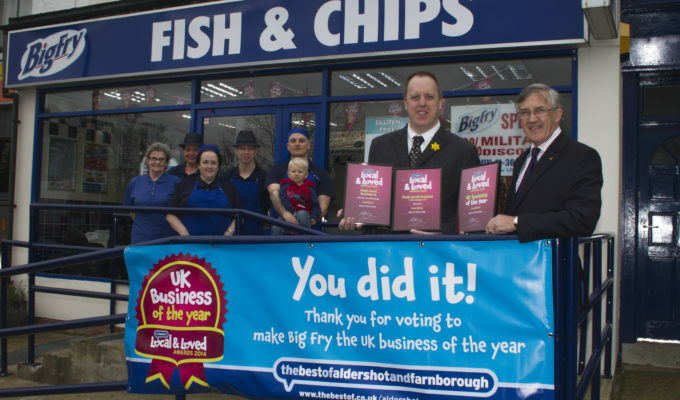 Big Fry Fish and Chips is proof that local business are thriving by providing a service and going the extra mile. Big Fry’s customers felt compelled to tell the rest of the UK about them and 2524 of them voted and left reviews to ensure they gained the coveted title. Buy Local Bear visited Farnborough for Gluten Free Mondays! 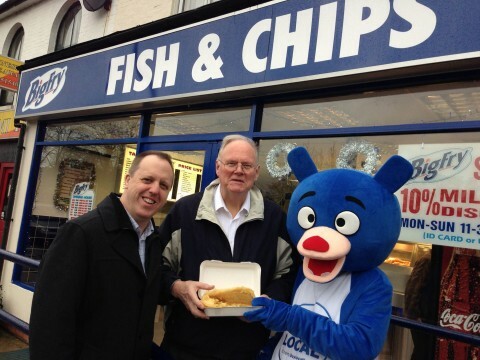 Roger George, a volunteer for the Celiac Society UK visited Big Fry (the “Gluten Free Monday” fish and chip shop) to raise awareness of celiac disease and the range of food now available for those who suffer. Celiac disease is a digestive disease that damages the small intestine and interferes with absorption of nutrients from food. People who have celiac disease cannot tolerate a protein called gluten which is found in wheat, rye, barley and possibly oats. When people with celiac disease eat foods containing gluten, their immune system responds by damaging the small intestine. Specifically, tiny fingerlike protrusions, called villi, on the lining of the small intestine are lost. Nutrients from food are absorbed into the bloodstream through these villi. Without villi, a person becomes malnourished regardless of the quantity of food eaten. The only way to stop this disease from causing any more damage is to stop eating gluten. Gluten is found in wheat, barley, rye and some oats. About 60% of wheat is made up of gluten. Since his diagnosis Roger has only had two episodes when he has eaten gluten with out knowing, he started to get headaches very quickly along with feeling sick which lasted for a few weeks! Buy Local Bear who is raising “Buy Local” awareness within the community and raising the profile of local businesses, making sure we all keep using them so they can continue to serve the local community, met with Roger today who said “My main symptoms were neurological which made me seek help, I also suffered with feeling very tired because my body wasn’t getting the vitamins it needs. I also had other symptoms but had lived with them for years not realising that I was celiac.” Peter was only diagnosed as celiac because he went for a blood test related to arthritis and it showed he wasn’t absorbing any nutrients apart from potassium. Further tests revealed that he did infact have celiac disease. Peter went on to say there are three things people normally miss when they are first diagnosed – bread, beer and fear of eating out. Cross contamination can be a real factor with celiacs, you only need a tiny amount for gluten for some people to feel the symptoms, it may be a little as crumbs from a slice of bread! So restaurants who do cater for Celiacs have to make sure their food is kept completing separate and prepared separately. As more people are being diagnosed with celiacs disease there is more food becoming available which is gluten free. Roger handed out samples for people to take away. Local celiac residents were able to choose from granola, mince pies, cakes and bread. Many people now even opt for a gluten free diet because it makes them feel better even thought they are not diagnosed as celiac. 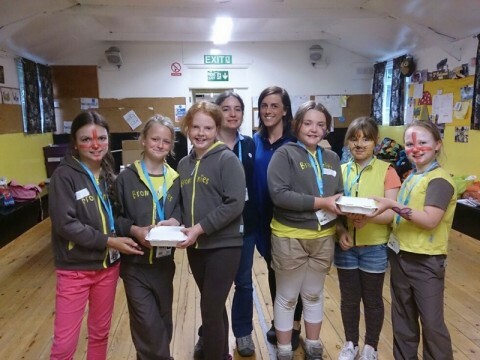 The Brownie unit enjoyed a fantastic fun day at Gilwell Park, Essex. After a fun but tiring day, and a long coach trip, hot food was the order of the day. We, at Big Fry Fish and Chips provided 32 meals for the brownies and their helpers. Jumbo sausage & chips chicken nuggets & chips cheese burgers & chips and cod & chips were ordered and enjoyed by all the brownies. Aldershot Town FC have been faced with some difficult decisions of late, with relegation and going into administration all we are hearing about, it was nice to enjoy an event like the Knights Cup without too much negativity. Matt Le Tissier, James Beattie, Dave Beasant and many other ex-pro players took to the Ebb Stadium for 30 minutes each way. Whist the pace was fairly slow we got to see some of those skills the players have been showing us over the years and the positive attitude of all the players and staff made the evening a great success. Big Fry in Farnborough were one of the main sponsors of the event and supplied 60 meals for the players and 130 meals for the supporters in the Ebb Lounge. “The team at Big Fry did a fantastic job, the food turned up on time was nice and hot and was enjoyed by all”. This was the second year Big Fry have supplied the food for The Knights Cup. The order was for a mixture of cod and sausage and chips, which was perfect for the occasion.